In order to successfully run the Allergy Awareness Challenge in a high school, we recommend that two student program coordinators work together with a teacher supervisor. More volunteers will be needed to run certain challenges and games, but most of the planning can be done before the actual challenges by the two program coordinators with the guidance of a teacher supervisor. Who Can Run the Program? Approximately 15 Total Hours over the course of 1-2 months. At the end of the program all volunteers will be awarded a volunteer certificate. It is up to the teacher supervisor to award hours accordingly to all volunteers based upon their level of participation. 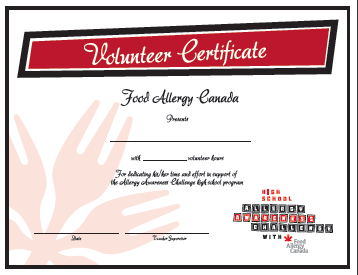 Running the Allergy Awareness Challenge as a student program coordinator is also a valuable volunteer experience because you can include it on your resume to highlight your organizational and leadership skills.